UPDATED: A painting by Swiss artist Ferdinand Hodler which its Jewish owner was forced by the Nazis to sell in 1938 has turned up in the art collection of prominent Swiss politician Christoph Blocher. Billionaire Blocher, the vice-president of Switzerland’s largest party, the right-wing Swiss People’s Party (SVP), owns the ‘most important collection of Swiss art from the period around 1900’, according to the Oskar Reinhart museum in Winterthur, which is currently exhibiting 80 works from Blocher’s collection including several by Hodler, one of the country’s most significant 19th century symbolist painters. According to newspaper Die Wochenzeitung, one piece in his collection which is not on display in Winterthur is ‘Lied aus der Ferne’ one of three variations by Hodler depicting the painter’s wife Berthe in a blue dress. The painting belonged to Polish-born German-Jewish industrialist and art collector Max Meirowsky, who was held in detention by the Nazis in Berlin in 1938. In November of that year he was forced to sell his art collection at an auction for works ‘from non-Aryan possession’ to finance his flight from Germany to Switzerland, where he died in 1949. While two of the three variants of Hodler’s painting belong to institutions — one in the Kunsthaus in Zurich and the other in the Musée d’Art et d’Histoire in Geneva — the third, Meirowsky’s. was rumoured to be in the hands of an until-now unknown private collector. Imke Gielen, a lawyer who represents Meirowsky's estate, told the Die Wochenzeitung that research suggested the painting was last seen on loan to a Hamburg art museum in 2002 before it disappeared, possibly due to the debate over the return of art owned by persecuted Jews. Gielen said the painting should be considered ‘looted art’ under the 1998 Washington Declaration because its owner was forced to sell it to escape persecution by the Third Reich. Historian Anja Heuss shares that view, adding that a request for its return could be lodged. “If the image at the auction in Germany was sold, it is stolen art,” she said. Contacted by Die Wochenzeitung, Blocher confirmed that he owned “a variant of the Hodler work”, and that this had indeed been displayed in a German museum several years earlier, but that he only learned of the possible origins of the painting many years after he bought it. "Since that time, there has been work on clarifying the circumstances and the legal situation. You will understate that no comment will be made until this clarification has been made," Blocher informed the weekly in writing. Gielen said she wishes to make contact with Blocher to find “a just and fair solution”, a phrase that echoes the 1998 Washington Declaration. An agreement signed by 44 countries including Switzerland, the declaration sets out how to deal with Nazi-confiscated art. In the case of artworks not yet returned to their pre-war owners or heirs, “steps should be taken expeditiously to achieve a just and fair solution” , it says. 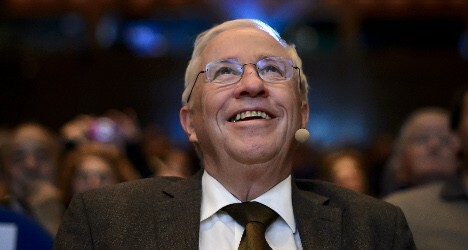 Though Blocher is not running in this Sunday’s federal elections, the news comes at an awkward time for the SVP, given Blocher is still the most visible face of the party. The 75-year-old right-winger is known for his boisterous campaigns against immigration, the EU and Islam, making him one of the country’s most talked-about politicians.